More than 150 economists back U.S. House of Representatives Speaker John Boehner’s call to match any increase in the debt limit with spending cuts of equal size, according to a letter released by the Republican leader’s office Wednesday. The letter will give Boehner an important talking point as he and his fellow House Republicans meet with President Barack Obama at 10 a.m. to discuss the debt limit and other fiscal issues. The American people also back him, 9:1 …. Anybody see the Tea Party hand in this caper? Campaign contributions from Goldman Sachs employees to President Obama are nearly seven times as much as President Bush received from Enron workers, according to numbers on OpenSecrets.org. President Bush’s connections to Enron were well-hyped during the company’s accounting debacle that rippled through the economy. Time magazine even had an article called, “Bush’s Enron Problem.” The Associated Press ran with the headline, “Bush-backing Enron makes big money off crisis.” David Callaway wrote that Enron for Bush was worse than Whitewater for Clinton. And so what is wrong with the media now? When you read this remember one thing, Moody’s is quasi-government enterprise. When the sub-prime crash hit, everybody asked, why were those junk sub-prime mortgage securities rated so high? Ask Moody’s. New warnings have surfaced that the United States — and the UK — are in danger of losing their top-notch AAA credit ratings. The U.S. and the U.K. have moved “substantially” closer to losing their AAA credit ratings as the cost of servicing their debt rose, according to Moody’s Investors Service. The governments of the two economies must balance bringing down their debt burdens without damaging growth by removing fiscal stimulus too quickly, Pierre Cailleteau, managing director of sovereign risk at Moody’s in London, said in a telephone interview. Under the ratings company’s so-called baseline scenario, the U.S. will spend more on debt service as a percentage of revenue this year than any other top-rated country except the U.K., and will be the biggest spender from 2011 to 2013, Moody’s said today in a report. … Under its adverse scenario, which assumes 0.5 percent lower growth each year, less fiscal adjustment and a stronger interest-rate shock, the U.S. will be paying about 15 percent of revenue in interest payments, more than the 14 percent limit that would lead to a downgrade to AA, Moody’s said. This has caused stocks to drop as fears about the US economy continue to grow. Bush’s fault NObala’s spending is totally out of control. Highest budget deficit in the country’s history, $220.9 billion dollars. Tell me, who even thinks this is remotely sustainable. The U.S. government ran up the largest monthly deficit in history in February, keeping the flood of red ink on track to top last year’s record for the full year. 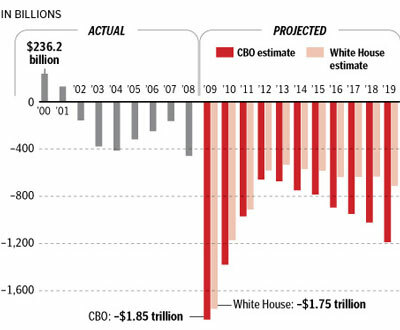 The Obama administration is projecting that the deficit for the 2010 budget year will hit an all-time high of $1.56 trillion, surpassing last year’s $1.4 trillion total. The administration is forecasting that the deficit will remain above $1 trillion in 2011, giving the country thrree straight years of $1 trillion-plus deficits. Weee, yipeee — spend spend spend like there is no tomorrow, because this means there will be no tomorrow.